Microwaves are electromagnetic waves within a frequency band of 300 MHz to 300 GHz. Within the electromagnetic spectrum (shown in Figure 1) they are embedded between the radio frequency range at lower frequencies and infrared and visible light at higher frequencies. Thus, microwaves belong to the non-ionising radiation. The microwave frequency range is also used for telecommunications such as mobile phones and radar transmissions. In order to prevent interference problems, special frequency bands are reserved for industrial, scientific and medical applications (called ISM-Frequencies). Due to those international regulations for industrial microwave applications mainly the frequencies 2450MHz and 915MHz are being used. For further information on the international standard for safety, readers can refer to the IEC60519-6 safety standard. 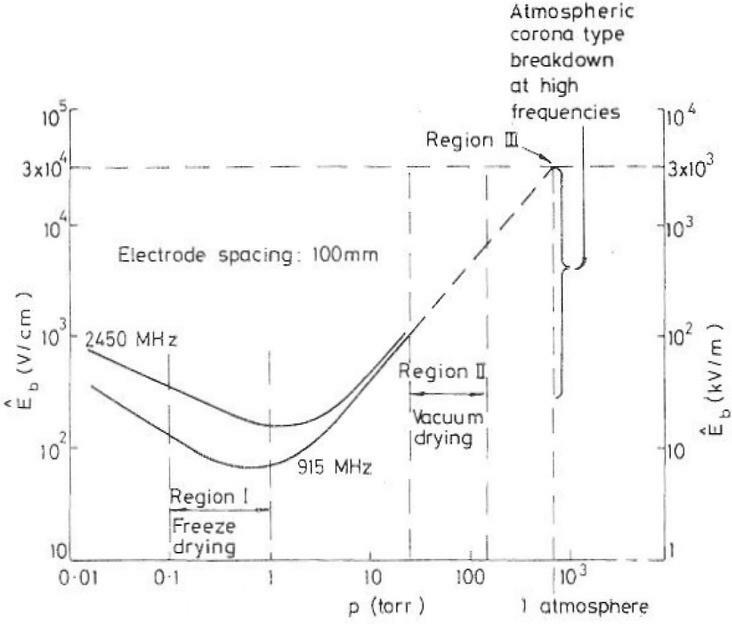 The limitations on heat transfer rates in conventionally conducted freeze drying operations have led to attempts to provide internal heat generation by the use of microwave power (Burke and Decareau, 1964; Copson, 1962). Basically a faster drying time can be achieved with microwaves because they generate the heat directly inside the product volume. A microwave freeze dryer in simple terms is a conventional freeze dryer, with the added capability of allowing microwaves to be applied in the drying chamber (Duan et al, 2008). The whole drying process proceeds under vacuum environment of 0,5 to 2,5mbar by sublimation. The quality of microwave freeze dried products is similar to conventional freeze dried products concerning texture. But compared to a conventional freeze drying system, which dries layer after layer starting from the outside, the microwave system generates heat within the product itself so that sublimation is taking place within the complete product volume. In contrast to the product itself water has only very low dielectric losses when in frozen condition below -10°C. 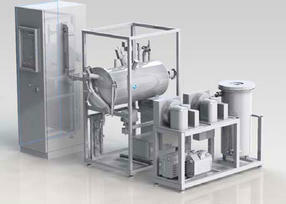 Therefore by the use of microwave freeze drying energy will mainly be absorbed by the organic molecules of the product. The dielectric losses of the water can be ignored during the first microwave freeze drying phase when the penetration depth is significant and energy can be transferred due to the dielectric losses of the organic product. This is the reason why microwave freeze drying is much more efficient and faster than conventional freeze drying. Experiments and numerical predictions show that drying costs can be reduced by using microwave freeze drying (Wu et al, 2004; Duan et al, 2010). More efficient drying in the falling rate period with little energy requirement (Duan et al, 2010; Feng and Tang, 1998; Torringa et al, 2001). In conventional freeze drying, the heat gradient is working from outside to inside. This limitation in transferring heat is causing the long drying time, especially when water is sublimated within fruits or vegetables while their surface layer, being already dry, is becoming more isolating and restricting for the heat transfer. The greatest advantage applying microwaves is that the energy is generated throughout the volume within the penetration depth. When water is frozen by temperatures lower than -5°C, the penetration depth of microwaves becomes even higher and they can penetrate deep into the bulk of vegetables, whole fruits and also complete product loads with a bulk to 20-40cm. Sublimation occurs throughout the complete volume of vegetables and fruits. This advantage has a tremendous impact on the increase of drying speed. Due to this fact, most of the microwave freezes drying processes are within the range of 1-4 hours to dry from 70-98% initial moisture to the range of 5-10%. The design and construction of microwave freeze dryers is challenging because mistakes in design can later on lead to plasma in the drying chamber. Generally Plasma will occur if the electric field intensity in the vacuum chamber is exceeding the break down voltage. Ionization of residual gases present in the vacuum chamber leads to the appearance of plasma light, causing burns on the product surface. The occurrence of this phenomenon is responsible for considerable energy losses and excessive heating of the materials dry zone, seriously damaging the final product (Arsem and Ma, 1985; Gould and Kenyon, 1971). 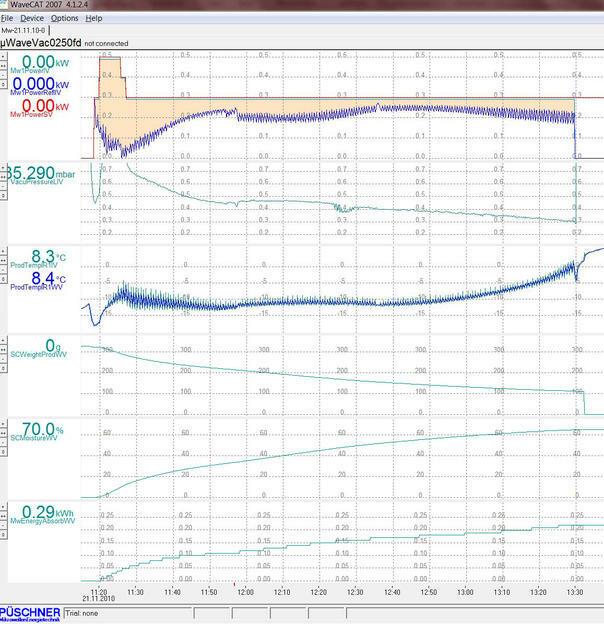 The threshold value of the break down voltage is depending on the vacuum. 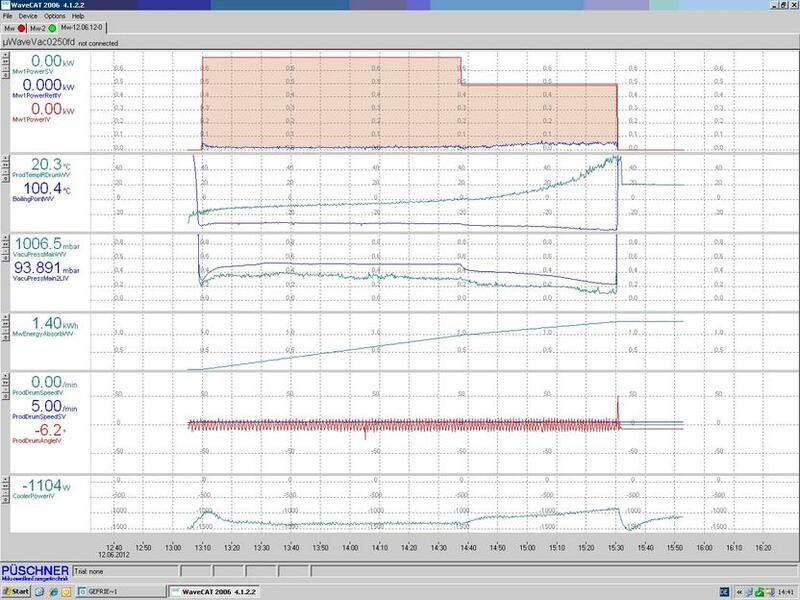 The minimum is within the vacuum pressure range used by conventional freeze drying (see picture 2). 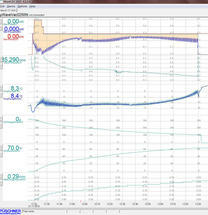 To avoid plasma discharges it is therefore necessary to optimize the process parameters chamber pressure and microwave power in connection with a good coupling and matching between the microwave generator and the vacuum chamber containing the product. Also important to avoid plasma is the design of the vacuum chamber itself (Duan et al, 2010). However this limitation was solved by Püschner microwave freeze dryer designs. The typical duration for conventional freeze drying is in the range of 20-60h depending on the type and quantity of vegetable or fruits to be dried. In the end drying stages the product temperature rises above 0°C, because when only little moisture is left inside the product the boiling point looses its influence on the product temperature. Temperatures of 0°C-50°C may occur. When the duration of end drying is long, as in conventional freeze drying, the product is exposed to elevated temperatures for hours. Moreover, heat conductivity of the product becomes very poor and it takes a lot of time to transfer heat into the product centre. This is a problem especially with whole fruits like strawberries, raspberries, blueberries etc. Due to excessive heating in this drying stage the volatiles like flavours, vitamins and antioxidants are attacked and cracked. The final product might still offer excellent textures and good rehydration properties, but it has lost most of its vitamins, antioxidants and flavours. But with microwave freeze drying with an overall duration of just a few hours, the exposure of the product to temperatures above 20°C is far shorter so that most of its vitamins, antioxidants and flavours can be maintained. Microwave frequency of 915MHz is mainly used for big industrial installations because magnetrons are economically available from 30kW up to 100kW. 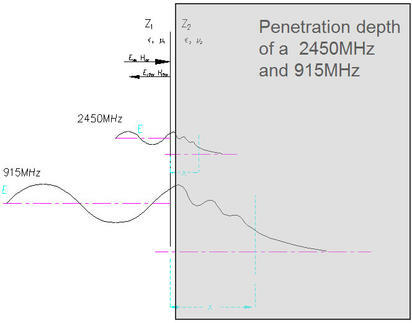 Also 915MHz has about a 2.7x bigger penetration depth (see Figure 4). Microwave vacuum drying and microwave freeze drying have one thing in common. In the final drying phase it is difficult to keep the temperatures low because with little moisture left in the product the actual temperature will not follow the evaporation temperature any more. The only way to avoid the temperature rising too high is to reduce the microwave energy density. Most foodstuffs with high moisture content have dielectric properties in a range of Ɛ’’ = 1.0 to 30 at around 25°C, which will decrease in frozen condition to Ɛ’’ =0.05 to 1.0. 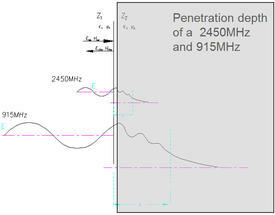 Then the penetration depth increases from 1 cm to over 10-20cm at 2450MHz and to 27-54cm at 915MHz. Drying of roots is interesting for medical research as well as for production as they contain many vitamins, antioxidants and flavours. Basically roots are mechanically very stable and can be tumbled and mixed during drying. An example for a root with intense aroma is horse radish. 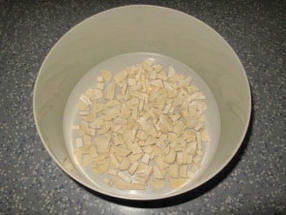 The experiment was carried out to assess the product quality of dried horse radish in respect of appearance and flavour. The Horse radish was subjected to gentle microwave freeze drying. 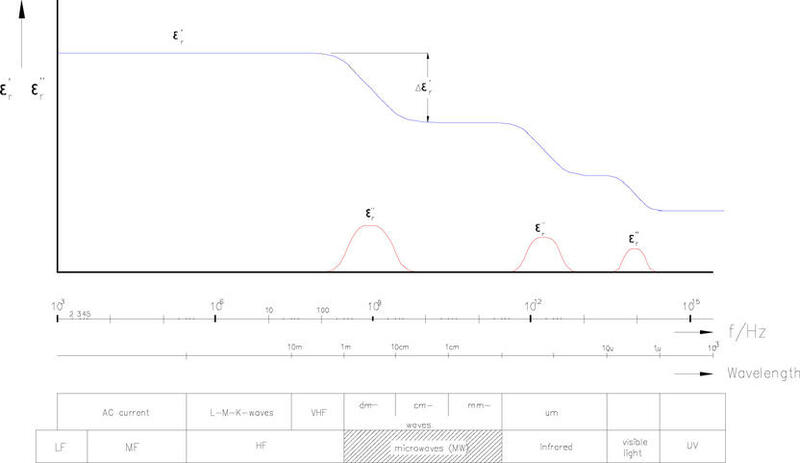 Process parameters and the image of dried product are shown in Figure 6 and Figure 7. It can be concluded that microwave freeze drying can produce a better product texture as well as higher quality compared to conventional freeze drying. Radish is widely used as a soup ingredient in food industry. Texture, rehydration and flavours are the main parameters for the food processing industry. The light white colour and sensitive fine structure require gentle drying conditions. Currently conventional freeze drying is being used to obtain a product with excellent texture and also to avoid high losses during processing. The drying time for such a process is in the range of 20 to 50 h. During those long drying times flavours are extremely reduced. This disadvantage can be avoided by microwave freeze drying where drying times from 2-4h are significantly shorter with better flavour retention. However, the shorter drying time means a compromise in terms of volume and rehydration water characteristics (see figure 8 and table 1). ¹ The Dehydration Ratio is measured by the water uptake of the dried product in 80°C hot for 1min in comparison to the initial weight before. 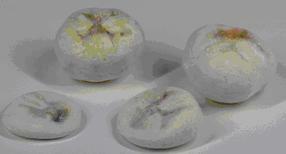 In the berry industry there is a huge demand for high quality dried whole fruits. In conventional freeze drying, strawberries are mainly dried in slices in order to maintain a significant heat transfer and mass transfer from the heated plates / shelves into the product. Whole strawberries are very difficult to dry with conventional freeze drying methods as drying time and energy requirement for such processes on an industrial scale are extremely high. But Microwave freeze drying of strawberries can achieve excellent textural properties as well as a good energy and heat transfer rate. 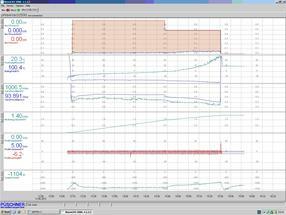 Table 2 shows the drying parameters. Figure 10 shows texture of strawberries after a 3 hour microwave freeze drying process. 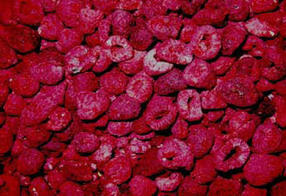 3kg of complete strawberries were dried in an open drum. Table 2: Drying parameters in the drying of strawberries. The freezing process has a big impact on the quality of the product to be dried. Moreover the freezing speed influences the size of the ice crystals. The faster it will freeze, the smaller the crystal structure and the better fine product structures will be kept. 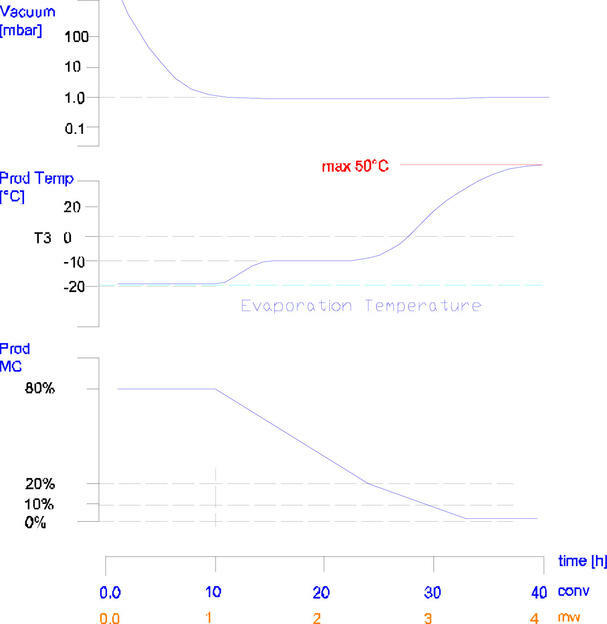 In figure 10 and 11 textural properties of frozen and microwave freeze dried strawberries can be compared. As shown in Figure 10, if there are frozen ice pieces or areas with higher water content throughout the volume of the strawberry, they have an impact on the microwave freeze drying process and quality of the product to be dried. Due to the uneven distribution of the electromagnetic field and due to differences in the product consistency, some parts of the strawberry may absorb higher energy densities and will rise in temperature. Once the product temperature exceeds the boiling point of -5 °C, the dielectric losses of frozen water increase significantly. As a consequence, the temperature will rise and frozen water becomes liquid causing a punctual high absorption of microwave energy. Water evaporates immediately within the product volume causing bubbles, which are destroying the original structure. Strawberries are a good example to demonstrate this effect (see figure 10). Therefore there is a requirement for homogeneous product properties such as size, shape and frozen condition as well as for the microwave energy to be as uniform as possible to enable a uniform microwave energy transfer into the product . For this reason moving the product while drying is also essential to provide an even energy uptake in each single product. The vacuum level also plays a key rule. 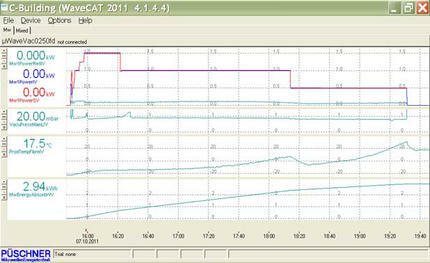 The lower the vacuum, the more safe the process will be due to the safety distance to the critical temperature of -5°C. Of course a low vacuum also means high costs. So a reasonable compromise needs to be found. As the above mentioned temperatures are based on normal tap water, it should be considered that the sugar content has also a huge impact and will increase the boiling point. To cope with products with high BRIX values, the vacuum should be as low as possible, taking into account the economic feasibility (Mageean et al, 1991). One more limitation is the outer peel which is working as a membrane with limited diffusion capacity. The mass transfer through this membrane is limited and is reducing the diffusion of moisture and mass transfer. To overcome this limitation, strawberries are finely perforated on the surface; this will enable a better diffusion and a higher drying rate. Figure 11 shows the texture of inner sections after microwave freeze drying. 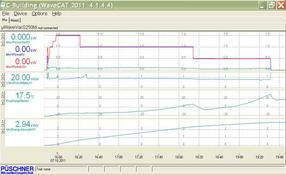 The samples in Figure 10 were dried under 1mbar vacuum in 2h, the samples in Figure 11 were dried in 5h with 0.5mbar. There is a high demand for bananas, mainly as a ingredient for cereal and snacks. The handling of banana slices is difficult as they are mechanically very unstable and oxidate quickly. However in frozen condition they are good to handle and are stable enough for microwave freeze drying in a drum (see picture 15). There can also be a combined drying process of microwave freeze drying with 1mbar as main drying step and microwave vacuum drying with 20mbar for end drying. During the vacuum drying at 20mbar a puffing effect can be achieved, extending the product volume by factor 2-5 (see picture 16). The demand for high quality food will increase during the coming years. The quality of microwave vacuum dried products is almost similar to freeze dried products, especially when high quality texture and fast rehydration are required. Regarding quality and preservation of valuable ingredients the microwave freeze dryers are superior to conventional freeze drying systems. In Industrial- and developing countries, the food producers will gain a better position alongside the global food companies such a, if they will be able to preserve and process their products after harvest. Thus farmers will become more independent from seasonal prices and will be able to offer high quality dried products to the market using microwave technology with microwave freeze dryers which need smaller footprint and lower costs than conventional freeze dryers. In order to cover the invest costs farmer may join into unions to share the production and drying facilities. On the consumer side people have an increased awareness of healthy food and are willing to pay for high value food with higher prices. In today’s global market place consumers find a wide selection of those mainly conventional freeze dried products like packed fruit & vegetable snacks offered by niche suppliers on the internet. It can also be observed that normal supermarkets are offering freeze dried snacks as special articles more often. The demand for those products such a is increasing. While the conventional freeze drying technology will get under more pressure due to the increase of energy cost and such a increasing steel prices and therefore it will be partly replaced by faster, smaller and more efficient microwave freeze dryers. The lab scale microwave vacuum dryer offers a freeze drying option. The minimum vacuum level is 0.5mbar. A 2kW/2450MHz vacuum dryer is generating microwave power in the range from 200 to 2000W. The IR camera can measure from -50 to 200°C. Also a fibre optical sensor is available to measure temperatures inside the product volume. The microwave vacuum dryer can be operated with various configuration modes using a turntable as well as open and closed drums. 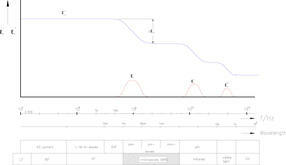 Using the turntable option, the weight losses can be measured online during the drying process using a load cell. A chiller provides a cooling power of about 1.5 kW at -50°C to re-condense the steam within the condenser. The steam volume is significant which must be accounted for by the design of the condenser, also to balance the re-condensing power against the applied microwave power. 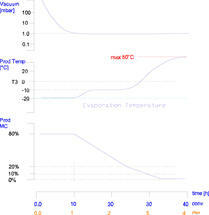 In general 2kW of microwave power will require about 2kW chilling power of the condenser. The first of four trials shown below was carried out in this lab microwave freeze dryer configuration as shown in Figure 18. The case studies with strawberries and raspberries were carried out in a 6kW/2450MHz microwave pilot scale freeze dryer. 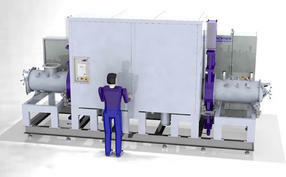 The largest production scale microwave freeze dryer is shown in the Figure 19 below. The use of microwave freeze drying has already started in high level ceramic, pharmaceutical and chemical industry. Soon microwave freeze drying will penetrate into the food industry starting with applications where the drying capacities and throughput rate are in the range of 5 to 100kg/h of high value product like medical herbs, roots (Ginseng) and also fruits as well as high value soup ingredients. The concept of microwave freeze drying is based on smaller footprint, higher energy efficiency and better quality in terms of volatiles compared to conventional freeze drying with long vacuum vessels and huge product loads. The application of microwave freeze drying in industrial drying systems is of growing interest, particularly because of the high energy efficiency and achievement potential. In the 21st century consumer have an increased awareness of healthy ingredients and aesthetic appeal of processed food and are willing to pay higher prices for high quality food. With the understanding of the medical significance of vitamins, antioxidants and flavour, microwave freeze dried products can gain a superior position as they retain much more valuable nutrients than conventional freeze dried products. Moreover, due to the increase of energy cost and processing cost and also increasing steel prices the conventional freeze drying technology will get more and more under pressure and will be partly replaced by faster, smaller and more efficient microwave freeze dryers in the time to come.